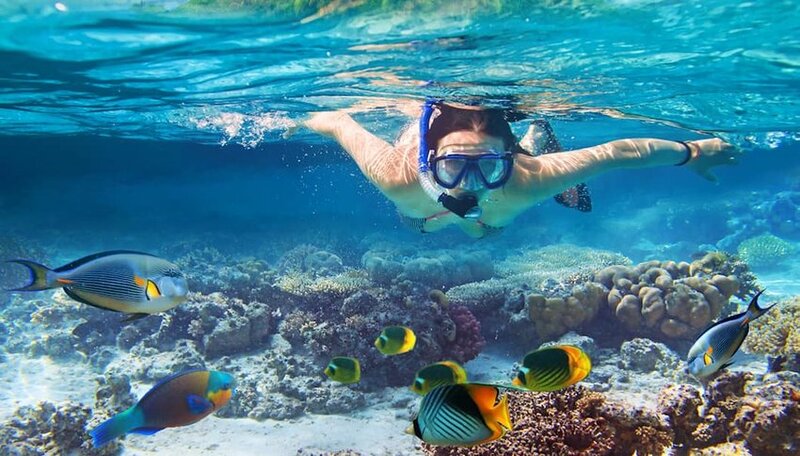 Whether you're a scuba diver or not, snorkeling along a beautiful reef can be a magical experience. But, did you know that you may be contributing to the death of that reef by engaging in behaviors that hurt the local eco-system? If you want to enjoy the marine life and coral on your tropical vacation, here are some tips on how to snorkel without killing the reef in the process. Using the right sunscreen can go a long way in helping preserve a coral reef’s lifespan. You should be using sunscreen that is reef safe and fish safe. It should also be biodegradable, and should not contain a variety of harmful ingredients like microbeads, benzophenone-3, zinc oxide, parabens and more. Some destinations are even making the choice for you by banning sunscreen that is not biodegradable and reef-friendly. 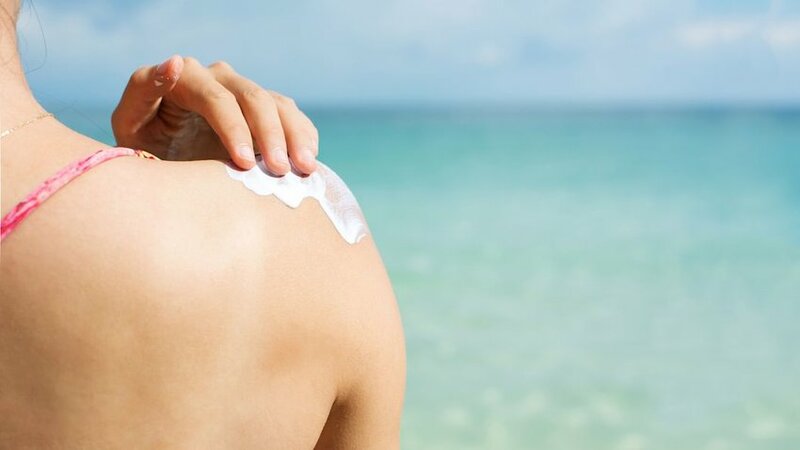 If you plan to visit Hawaii in 2021, you’ll need to comply with the new law that bans a number of harmful chemicals found in popular sunscreen brands. Key West recently voted to do the same, so you can expect that other destinations might start to follow. Removing anything, even something seemingly unimportant, from the bottom of the ocean can disrupt the eco-system. Do not ever break off a piece of coral, and watch what shells you are taking, even along the shoreline. You might be walking away with a hermit crab or some other form of marine life that’s hiding inside. You should never touch the coral when you’re snorkeling or diving. It is very fragile, and even just a slight brush along it can cause damage to the reef. Also, some coral formations can actually hurt you if you touch them or brush up against them. If you accidentally hit fire coral while snorkeling, you’ll know it when you develop a rather painful and raised rash later on. Depending on the amount of toxins you’re exposed to, you could have a rash for days or even develop a secondary infection. This is a hotly-debated topic, with some popular tourist destinations feeding the marine life in order to bring them around for guests. Feeding them can disrupt natural fish behavior and cause them to become dependent on the tourist boats bringing guests out to snorkel. When you are choosing a tour operator, look for ones that don’t chum the waters or feed the stingrays. This has been a growing problem in recent years, with people touching and harassing the marine life in destinations they visit. Just because you saw someone on Instagram do it doesn’t mean you need to repeat bad, and potentially illegal, behavior. 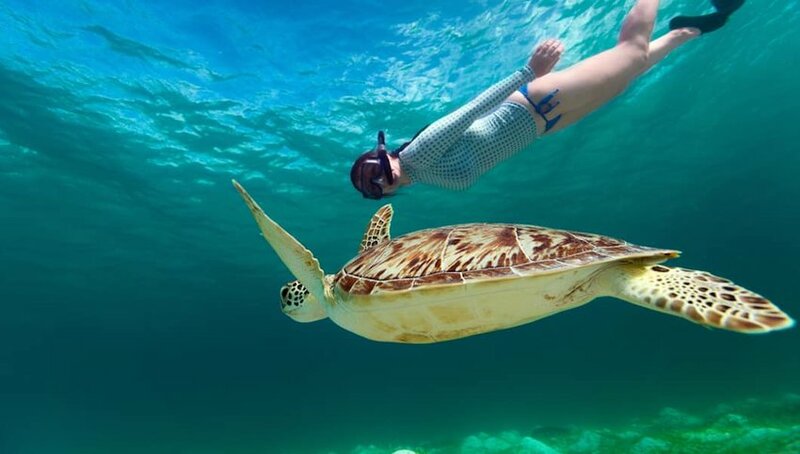 Despite some blogs that encourage getting up close and personal with the turtles while snorkeling, it’s actually illegal to touch and harass sea turtles in some countries, like Belize. So keep a safe distance and remember — you're in their home. It should go without saying, but if you’re on a boat, make sure all your trash stays onboard and doesn’t land in the water. Sometimes winds can pick up while you're snorkeling and you may not even realize that something flew off the boat. Make sure everything is secured and thrown out when you return back to shore. If you see trash and you can safely pick it up, you should. If there is trash that is pinned against the coral, let your guide know if he or she doesn’t already see it so they can safely remove it from the reef. People often think buoyancy control is only for diving, but it’s also very important when snorkeling to ensure you are staying away from the reef. Use fins to keep yourself horizontal when swimming over shallow sections, and learn how to float without needing to step down. Even putting your fin on the sandy or seagrass bottom can be harmful, as there could be a stingray or other marine animal that is resting on the seabed.